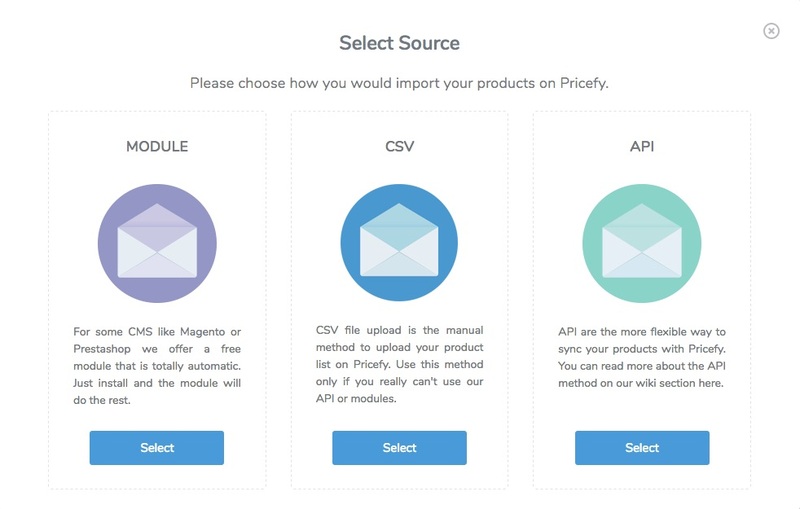 During the onboarding process, PRICEFY will ask you to choose which type of importing process you would use. In this particular case you must select CSV (Comma Separated Value). To be prepared for the next next, you must first know how the CSV should be structured. 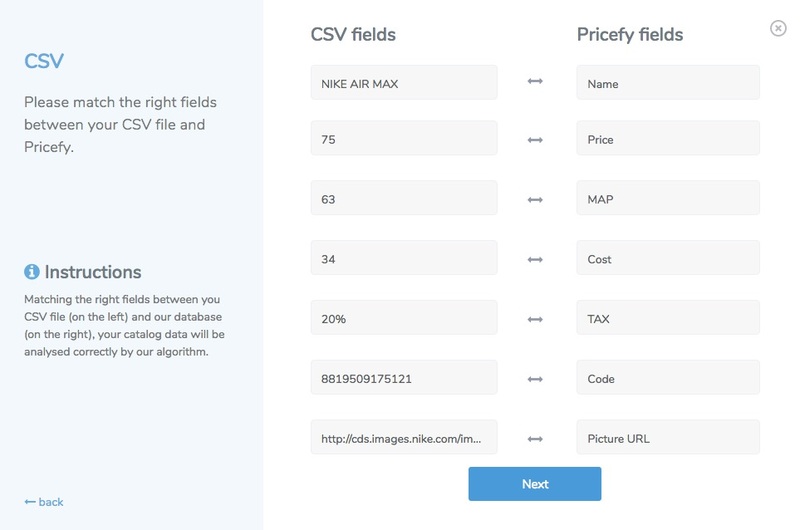 Here is a simple CSV structure that you can fill with your products data. The only mandatory field is "Code". Without this information on the product row, the import process for products who don't contain it, will fail. CSV file must be separated by comma. Other separators will not work at the moment. We use this information to let you easily recognize your products inside the PRICEFY dashboard. We use it to calculate your price positioning on the market and against your competitors. Prices must be tax included. MAP: Is the minimum advertised price that your wholesales or distributor has provided you. Useful if you would be alerted when you are selling at a lower price than the MAP. We use this to calculate your markup and discover potential new markets opportunities . Costs must be tax included. We use this to auto-add Price and Cost value if you imported them tax excluded. This is the most important and mandatory field. We use the EAN/UPC code to search your products on internet and match them against your competitor's catalog. PhotoURL: Is the product's image file URL. Useful to help you recognize your products inside the PRICEFY dashboard. 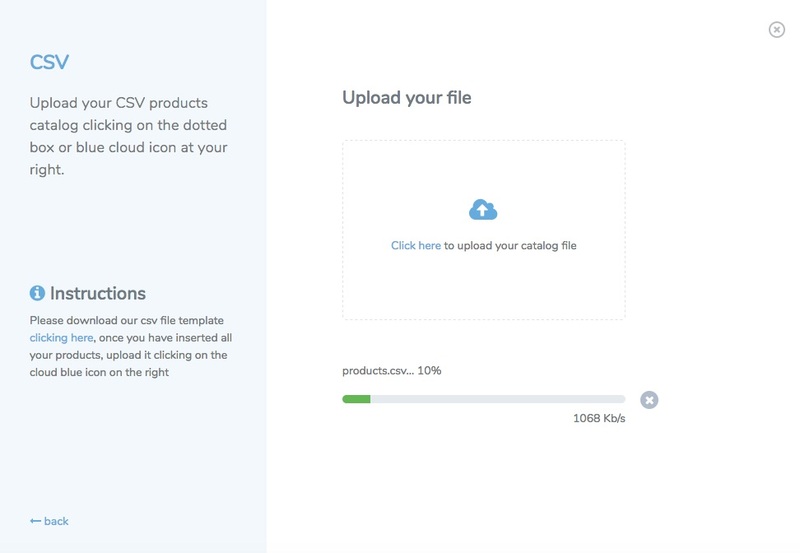 Once you will have prepared your file, proceed with the upload. Just drag and drop your file or select it from your computer folder. 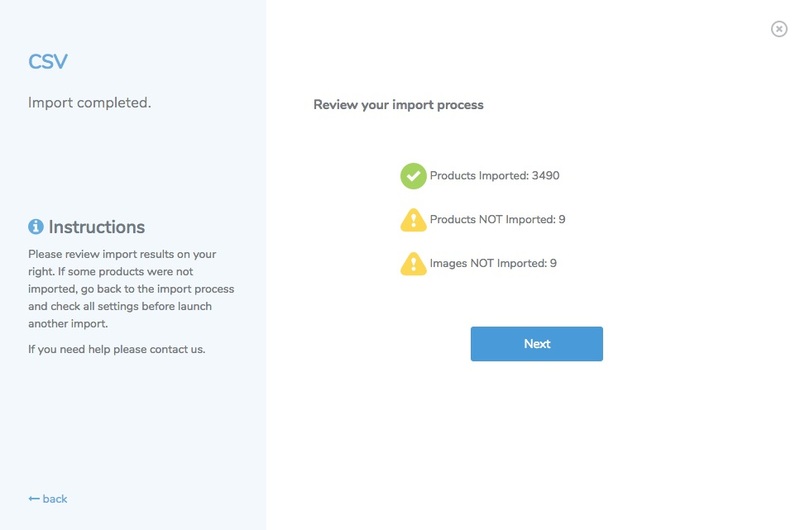 Now that your products file is uploaded, you must decide what kind of import you want to launch. Full: It will completely restore your catalog, deleting old products and importing only what you have on your last uploaded products file. Update: It just append your uploaded products file to your actual catalog products. Add Taxes To Cost Value: Add your tax percentage value to your products cost. This is a very useful option because usually, wholesalers and distributors provide their catalogs with cost tax excluded. 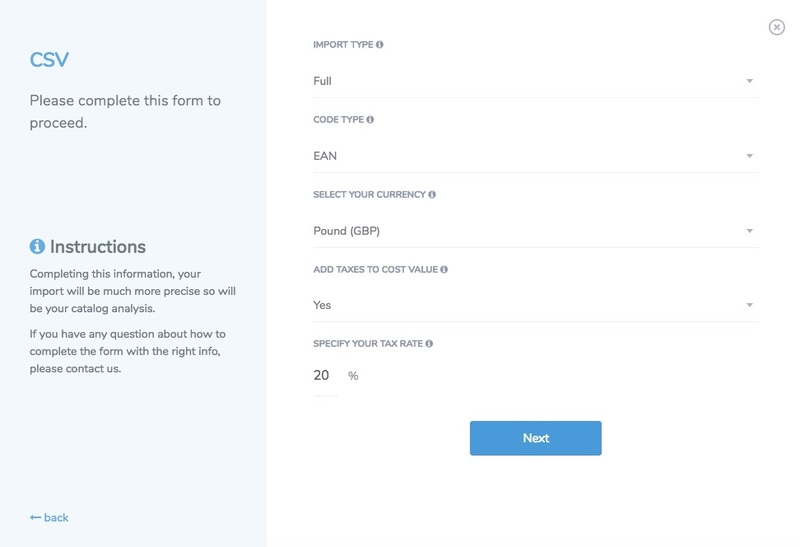 Specify Your Tax Rate: In case you have selected "Yes" at "Add Taxes To Cost Value" here you can define which is the tax percentage you would charge. 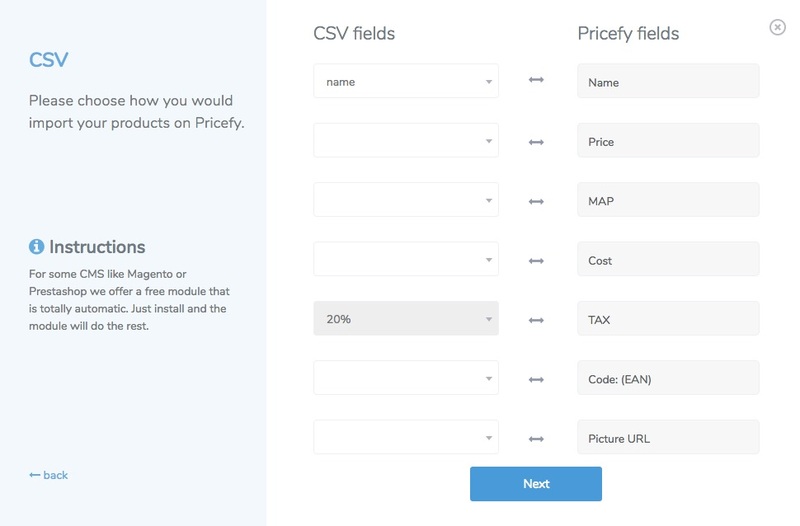 Using the first row of your file, PRICEFY will provides you a list of fields that you must map to our fields list. Using "SKIP" value, in the CSV fields dropdown, you can avoid importing column you don't need. 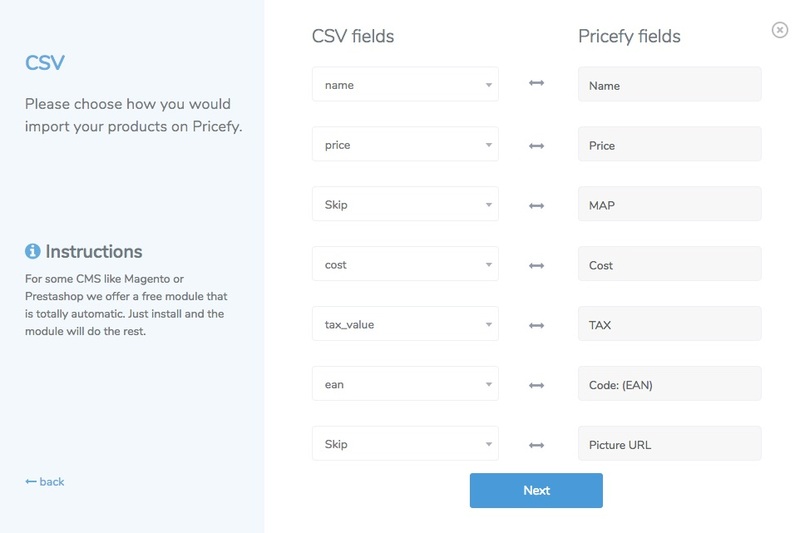 PRICEFY will show you how the CSV file will be imported, using the second row of your product file (first one is the file header). If everything is ok, you can press next and let import start. 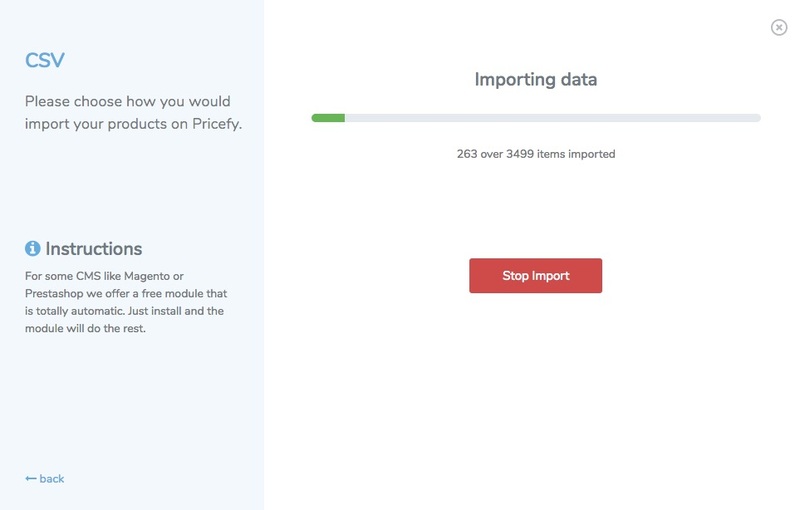 When the import will be finished, PRICEFY will show you a report of how many products have been imported or rejected.